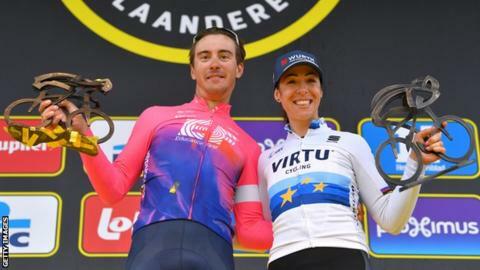 Italy's Alberto Bettiol pulled off a shock solo win in the men's Tour of Flanders in Belgium to claim his first ever professional victory. The Education First rider, 25, attacked with 18km of the 267km one-day cobbled classic to go and held off a chasing group of the pre-race favourites. It was the second Italian victory of the day after Marta Bastianelli won the women's race in a sprint finish. "My first victory, I just don't believe it," said Bettiol. After kicking clear on the penultimate climb of the Oude Kwaremont, Bettiol held his advantage over the Paterberg and rode solo to the line as the chasers marked each other behind. Denmark's Kasper Asgreen, who had been in an earlier breakaway, attacked late on to take second, 14 seconds back on Bettiol, while former winner Alexander Kristoff of Norway won the sprint for third. "I was feeling really good, my team said, 'If you can, just go,' so I closed my eyes and I just went," added Bettiol. "I looked round at the top and I had a really good gap so the team told me to just keep pushing - the last 14km was the longest of my life." It is Bettiol's first individual victory since turning professional in 2014, having only won a team time trial stage at last year's Tirreno-Adriatico previously. The Tour of Flanders is the second 'monument'- the five most prestigious one-day races - in the cycling calendar, after Milan-San Remo, which was won by France's Julian Alaphilippe last month. Paris-Roubaix will take place on 14 April, with Liege-Bastogne-Liege on 28 April, before Il Lombardia, the last monument of the season, on 12 October. In the women's race, former world champion Bastianelli attacked with 13km remaining of the 159km route and was joined by Annemiek van Vleuten, Cecilie Uttrup Ludwig and Katarzyna Niewiadoma. Niewiadoma was dropped on the final climb of the Paterberg, with the leading trio maintaining a small advantage into the home straight. Two-time world time trial champion Van Vleuten led out the sprint, but European champion Bastianell kicked round her to claim her third victory of the season, with Ludwig third. "I'm really happy about this incredible result, it was a very hard race but I pulled it off," said Bastianelli, 31. "I've won some big races but this is a very, very important one for me."